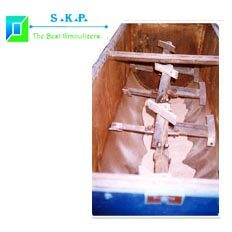 The Ribbon Cutter Blender is demanded for mixing dry powders and grits of different bulk densities. The Ribbon Cutter Blender is used in food, mineral, pharmaceutical, paint and chemical industries. The Ribbon Cutter Blender can mix some wet materials with the help of its simple versatile mixer and grills. Cutters of various designs are available to handle different materials. The mixer consists of a cylindrical shell inside which rotates a double helix shaft fitted with spiral inner and outer Cutters. During rotation of the shaft, the ribbons lift, convey and inter-mix the material to get a homogeneous mass in short intervals. Discharge is from the bottom by a quick opening valve.